This time last week I sat for three hours waiting for Fence's website to get back online so I could buy a ticket for Homegame. I swiftly became bored of hitting refresh repeatedly and decided to have a go at designing a poster for the upcoming Trapped Mice EP Launch. Being a bit crap at art I started looking for images I could 'creatively borrow' and a search along the lines of "neutral milk hotel gig poster" threw up the image below. 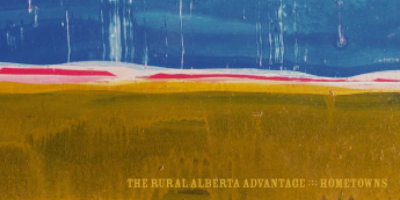 Coming up third in the search results was a picture from a review of The Rural Alberta Advantage's Hometowns, a band and album I'd never heard of before but for some reason I was attracted to the artwork. The review compared them to Neutral Milk Hotel and that was enough for me to give them a listen on Spotify, since then the album's been played almost non-stop around the house, if you've not heard of them before I really would recommend looking them up. The record is packed with catchy yet moody harmonies but if you need it narrowed down to a track or two then I'd say that Frank Ab and Don't Haunt This Place are must listens. This album is neither Scottish or particularly new, it was originally released in 2008 by a bunch of Canadians but I'll definitely be playing something from it on our first show back on Fresh Air because the songs on it are simply astounding. The band's second album Departing is being released on the 1st March featuring Stamp which you can download for free from the link below, all you have to do is give Saddle Creek your email address.